Tied at 69 apiece well inside the final minute of the match, Fury blew a key scoring opportunity to allow the home side in to take a huge win in the title race. 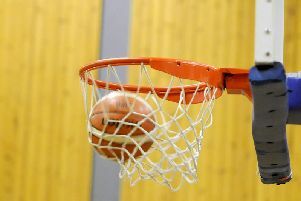 The Falkirk side’s new signing Boris Matrakov led Fury with 20pts and Austrian Adam Hammerschmidt racked up 19, 16 in a second half which saw Fury play much better than their first half performance. 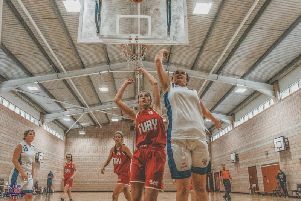 Down by three , 18-15, at the end of the first, Fury had struggled to capitalise on the scoring opportunities they were creating. Add to that the constant battle to keep Reign’s transition offence in check, it was perhaps a surprise that Fury were only down by six at the half. Matrakov and Zigy Dauksas led Fury on eight and seven points respectively. The third saw Fury start strongly and the game was quickly back at two points on several occasions, but Reign kept their up tempo game going and by the end of the third had stretched their lead to 11. So it was all to do for the Sony sponsored side as their large away support urged them on right from the start of the final stanza. With a switch of defence and a three point barrage Fury, who initially dropped 12 behind in the fourth, saw threes from Matrakov (2), Hammerschmidt (2) and Leginus ( 1) and a three point play from Hammerschmidt, a great post up play by Greek, Greg Foussas, and another two point play from Leginus saw the match tied at 69 apiece. The home fans could not believe their side had allowed a double digit lead to evaporate and held their breath when Fury broke down the court only to miss what seemed like a certain lay-up for their first lead of the game with less than 30 seconds to play. Reign then closed out the game with two winning plays for a 5 point victory. Fury now stand at two wins and two losses in the Championship. Fury head coach John Bunyan told the Falkirk Herald post-match: “We knew we would have to be at our best to win this game on Reign’s court and that did not happen. “Our execution was poor in the first two periods and we struggled to cope with the transition of Reign‘s offence.